This bibliography concentrates on works of fact and fiction that may prove useful in inspiring adventures and campaigns. Darwinizing Culture, edited by Robert Aunger. The Electric Meme: A New Theory of How We Think, by Robert Aunger. Combat Fleets of the World, 2000-2001, by A.D. Baker III. See also the more recent The Naval Institute Guide to Combat Fleets of the World, 15th Edition, by Eric Wertheim. The Discovery of the Titanic, by Robert D. Ballard. The Eternal Darkness, by Robert D. Ballard. Explorations, by Robert D. Ballard. The New Solar System, Fourth Edition, edited by J. Kelly Beatty, Carolyn Collins Peterson, and Andrew Chaikin. The World, The Flesh, and the Devil (2nd Edition), by J.D. Bernal. The Meme Machine, by Susan J. Blackmore and Richard Dawkins. Whales of the World, by Nigel Bonner. The Spike: How Our Lives are Being Transformed By Rapidly Advancing Technologies, by Damien Broderick. Virus of the Mind: The New Science of the Meme, by Richard Brodie. Flesh and Machines: How Robots Will Change Us, by Rodney Brooks. Cambrian Intelligence: The Early History of the New AI, by Rodney Brooks. The Blue Planet, by Andrew Byatt, Alastair Fothergill, and Martha Holmes. Companion book to the miniseries (below). The Social Life of Information, by John Seely Brown and Paul Duguid. The Cerebral Symphony, by William Calvin. Nanotechnology: Molecular Speculations on Global Abundance by B.C. Crandall. El Niño, by Ross Couper-Johnston. Dolphins, by Jacques-Yves Cousteau and Phillipe Diolé. The Selfish Gene, by Richard Dawkins. The Extended Phenotype: The Long Reach of the Gene, by Richard Dawkins. Brainchildren: Essays on Designing Minds, by Daniel Dennett. Engines of Creation by K. Eric Drexler. Nanosystems: Molecular Machinery, Manufacturing, and Computation by K. Eric Drexler. Unbounding the Future by K. Eric Drexler, Chris Peterson and Gayle Pergamit. Computational Principles of Mobile Robotics, by Gregory Dudek. Meteorology, 2nd Edition, by Joe R. Eagleman. Sea Change, by Sylvia A. Earle. Encyclopedia of the Sea, by Richard Ellis. Mirror Matter: Pioneering Antimatter Physics, by Robert Forward and Joel Davis. The Naval Institute Guide to World Naval Weapons Systems, 1997-1998, by Norman Friedman. The fifth edition is more recent (2006). Nanomedicine Volume 1: Basic Capabilities, by Robert A. Freitas Jr. Seven Tenths, by James Hamilton-Paterson, published in the United States as The Great Deep. Mission To Saturn: Cassini and the Huygens Probe, by David M. Harland. Colonies in Space, by T.A. Heppenheimer. Space Settlements: A Design Study, edited by Richard D. Johnson and Charles Holbrow. Prospects in Nanotechnology: Towards Molecular Manufacturing, by Markus Krummenacker, edited by James Lewis. The Age of Spiritual Machines, by Ray Kurzweil. Gene Future: The Promise and Perils of the New Biology, by Thomas F. Lee. World Atlas of the Oceans, by Manfred Leier. Mining the Sky, by John S. Lewis. Nanotechnology: Research and Perspectives by James Lewis, edited by B.C. Crandall. Deep Space Propulsion: A Roadmap to Interstellar Flight, by K.F. Long. Lifting Titan's Veil: Exploring the Giant Moon of Saturn, by Ralph Lorenz and Jaqueline Mitton. Thought Contagion: How Belief Spreads Through Society, by Aaron Lynch. Living Off the Land in Space: Green Roads to the Cosmos and Paradise Regained: The Regreening of Earth, by Greg L. Matloff, Les Johnson, and C Bangs. The Big Book of Conspiracies, edited by Doug Moench. Mind Children: The Future of Robot and Human Intelligence, by Hans Moravec. Robot: Mere Machines to Transcendent Mind, by Hans Moravec. Introduction to AI Robotics, by Robin R. Murphy. The High Frontier, Third Edition, by Gerald K. O'Neill. 2081: A Hopeful View of the Future, by Gerald K. O'Neill. Beyond Humanity: CyberEvolution and Future Minds, by Gregory S. Paul, and Earl Cox. The Oceans, by Ellen J. Prager with Sylvia A. Earle. Great Mambo Chicken and the Transhuman Condition, by Ed Regis. Nano: The Emerging Science of Nanotechnology, by Ed Regis. Smart Mobs: The Next Social Revolution, by Howard Rheingold. Jane's Fighting Ships 2001-2002, by Stephen Saunders. See also the current edition. The Millennial Project, by Marshall T. Savage. Islands in the Sky, edited by Stanley Schmidt and Robert Zubrin. Remaking Eden: How Genetic Engineering and Cloning Will Transform the American Family, by Lee M. Silver. Exploring Ocean Science, 2nd Edition, by Keith Stowe. The Third Millenium: A History of the World, AD 2000-3000, by Brian Stableford and David Langford. Tomorrow Now: Envisioning the Next 50 Years, by Bruce Sterling. The Third Industrial Revolution, by G. Harry Stine. Redesigning Humans, by Gregory Stock. Generations: The History of America's Future, 1584 to 2069, by William Strauss and Neil Howe. Essentials of Oceanography, 3rd Edition, by Harold V. Thurman. See also the current edition, by Alan P. Trujillo and Harold V. Thurman. The Third Wave: The Classic Study of Tomorrow, by Alvin Toffler. United Nations Convention on the Law of the Sea, United Nations. See also Bernaerts' Guide to this convention. U.S. Navy Diving Manual, by U.S. Department of the Navy. Solar Sails: A Novel Approach to Interplanetary Travel, by Giovanni Vulpetti and Les Johnson. The Deep Sea, by Joseph Wallace. Sea and Air, 2nd Edition, by Jerome Williams, John J. Higginson, and John D. Rohrbough. Entering Space: Creating a Spacefaring Civilization, by Robert Zubrin. The Case for Mars, by Robert Zubrin and Richard Wagner. Harvest of Stars, The Stars Are Also Fire, Harvest the Fire, and The Fleet of Stars, by Poul Anderson. The "Culture" series: Consider Phlebas, The Player of Games, Use of Weapons, Excession, and Look to Windward, by Iain Banks. Queen of Angels, by Greg Bear. Moving Mars, by Greg Bear. / (Slant), by Greg Bear. Darwin's Radio and Darwin's Children, by Greg Bear. The Seedling Stars, by James Blish. The Fortunate Fall, by Raphael Carter. New Atlantis, by Earl E. Clark. The Deep Range, by Arthur C. Clarke. Nanotech, by Jack Dann and Gardner Dozois (editors). Ribofunk, by Paul Di Filippo. Down and Out in the Magic Kingdom, by Cory Doctorow. When Gravity Fails, A Fire in the Sun and The Exile Kiss, by George Alec Effinger. Permutation City, by Greg Egan. Diaspora: A Novel, by Greg Egan. Firestar, Rogue Star, Lodestar, Falling Stars, and The Wreck of The River of Stars, by Michael Flynn. Indistinguishable from Magic, by Robert L. Forward. Pattern Recognition, by William Gibson. Forever Peace, by Joe Haldeman. Mindstar Rising, A Quantum Murder, and The Nano Flower, by Peter Hamilton. The first two books have been collected as an omnibus volume. A Deeper Sea, by Alexander Jablokov. War Games, by Karl Hansen. Beggars in Spain, Beggars and Choosers, and Beggars Ride, by Nancy Kress. Terminal Café, by Ian McDonald. The "Fall Revolution" series: The Star Fraction, The Stone Canal, The Cassini Division, and The Sky Road, by Ken MacLeod. Also available as two omnibus volumes. The Bohr Maker, by Linda Nagata. Limit of Vision, by Linda Nagata. Dream Park, The Barsoom Project, The California Voodoo Game, and The Moon Maze Game, by Larry Niven and Steven Barnes. The Descent of Anansi and Saturn's Race, by Larry Niven and Steven Barnes. Gaia's Toys, by Rebecca Ore. The Silicon Man, by Charles Platt. Red Mars, Green Mars, and Blue Mars, by Kim Stanley Robinson. Software, Realware, Wetware, and Freeware, by Rudy Rucker. Also available as a 4-in-1 omnibus volume. Inherit the Earth, Architects of Emortality, and The Fountains of Youth, by Brian Stableford. The Diamond Age, by Neil Stephenson. Holy Fire, by Bruce Sterling. Heavy Weather, by Bruce Sterling. Schismatrix Plus, by Bruce Sterling. Distraction: A Novel, by Bruce Sterling. Toast and Wireless, by Charlie Stross. Vacuum Flowers, by Michael Swanwick. The Ophiuchi Hotline, by John Varley. Steel Beach, by John Varley. The Golden Globe, by John Varley. Twenty Thousand Leagues Under the Sea, by Jules Verne. Across Realtime, by Vernor Vinge. An omnibus containing The Peace War, the short story "The Ungoverned," and Marooned in Realtime. A Fire Upon the Deep, A Deepness in the Sky, and The Children of the Sky, by Vernor Vinge. Voice of the Whirlwind, by Walter Jon Williams. Macrolife: A Mobile Utopia, by George Zebrowski. Transmetropolitan, by Warren Ellis and Darick Robertson. Appleseed, by Masamune Shirow. Four volumes: The Promethean Challenge, Prometheus Unbound, The Scales of Prometheus, and The Promethean Balance. Ghost in the Shell, Ghost in the Shell 1.5: Human-Error Processor, and Ghost in the Shell 2 – Man/Machine Interface, by Masamune Shirow. The Dirty Pair: Run from the Future, by Adam Warren. NASA Near Earth Object Orbits Software. A 3D orbit visualizer for thousands of NEOs. Planet's Orbits, by Alcyone Software. Shareware digital orrery software. Celestia, by Chris Laurel. A constantly updated freeware astronomical object simulator (among other things). All the major objects in the solar system are included, as are virtually all of the smaller ones. X-Plane, by Laminar Research. A continuously evolving flight simulator that can be tweaked. See their section on using it for flight simulations on Mars. Orbiter, by Martin Schweiger. A shareware flight and orbital dynamics simulator. Very impressive graphics and expandability. 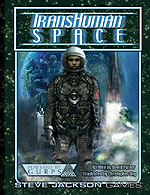 The Transhuman Space web page at www.sjgames.com/transhuman/links.html maintains updated links to online documents and web pages relating to both transhumanism and space colonization.